'Old Bucky' (as a newspaper columnist famously nicknamed the earthquakes of the last 1.5 years). Whether this is true or not is contested. Even The Wizard (doesn't every town have one? ), has come out of retirement to lend his considerable personality to the 'Save The Cathedral' project. and to Cathedral Square. I think this gives you a good idea of what the city centre looks like more than a year after the 'big one'. The gap (right) is where Vivace coffee shop used to be. starbucks! When I can go back in here, I'll know things are getting back to normal. Wow. We don't see any of this on TV anymore really. Had no idea it was still like that. Some of the buildings look ok that are fenced off, what's with that? The bottom part of the Cathedral looks ok still. It is such a shame to see it go. The fenced off buildings all have one of two problems. 1) they are actually in bad shape, and when you get closer you begin to see asymmetries and cracks that let you know there is something going on in the structure, or 2) they are in the shadow of a building slated for demolition that could come down in a big aftershock. Thank goodness there haven't been many of those lately! reading the note placed on the fence about the Cathedral ... as much as its an icon of Christchurch and a historical building, to repair the building 20-80 million? 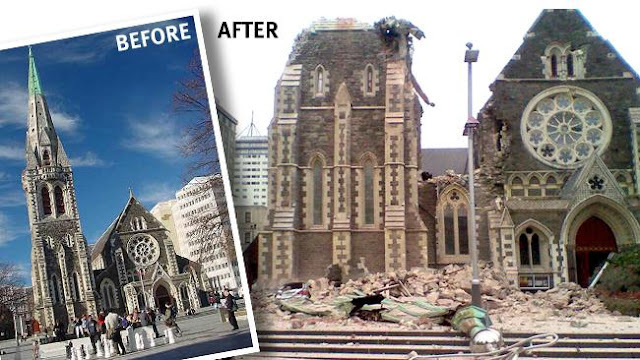 i feel that would be put to better use to get the people of Christchurch back in their homes. some of the houses are still using port-a-loo's. it is a shame to see it go, but the money to repair has beeter places to go. True, it would be great to see everyone in a better living situation. Our nieghbours are facing another cold, dark winter with a plywood patched house! As far as I understand though, regarding the Cathedral, this is a building owned by the Anglican church, and they also own the land under it. They want a church on that land. The choice of rebuild or replace is entirely at the churches discretion, and the cost is borne by them also. It won't be public money. They are probably as much at the mercy of their insurer as anyone else. I'm not sure how much it would cost to actually build a massive church... it must be more than $30 million then.. hard to believe, huh? It's coming up on a year since I was there, and while I know that lots of "stuff" has been done, the overall lack of progress is pretty astounding. I'm gobsmacked that your lovely neighbours are still waiting for their house to be repaired! So sad to see the cathedral go... let's hope that whatever is built in its place is a worthy replacement. I'm trying to imagine how I'd feel if it was my city and many of my familiar landmarks were just wiped out. No Flinders St station? St Pauls Cathedral? Princess Theatre? Wow.